Because of this susceptibility, correctional facilities can serve as ampliﬁers of MRSA skin disease. Identiﬁcation of MRSA infections among inmates can be made by passive or active surveillance. Waiting for inmates to access medical care for “spider bites”, rashes, bumps, or boils is passive surveillance. This is appropriate where there are very few cases of staph skin infections. Facilities with multiple cases need more active programs for recognition, including routine screening for infections and the use of diagnostic tests. 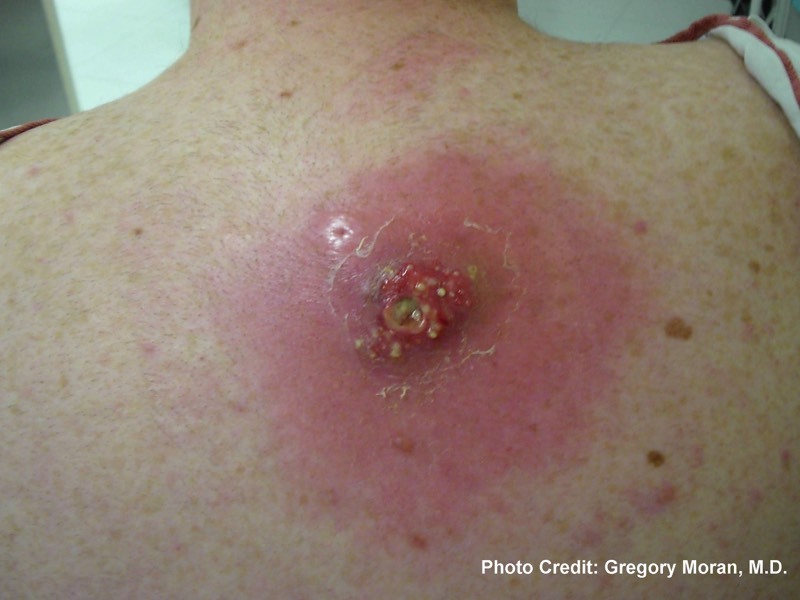 Misconceptions about the nature of MRSA skin infections may hinder early identiﬁcation. For example, some inmates with MRSA have complained of having spider or insect bites, and they may not seek or receive timely treatment. This treatment delay may allow the spread of infection. The reliability of such diagnostic methods as bacterial cultures and susceptibility testing is enhanced by supplying the healthcare staﬀ with resources to allow adequate specimen collection for culture and by staff using the proper technique when obtaining material for culture and susceptibility testing (e.g. culturing exudate, not dry swab). When there has been exposure to an MRSA- infected detainee/inmate, particularly by persons who may be at high risk for MRSA infection, including those who have been recently hospitalized, have a suppressed immune system, use medical devices, such as a dialysis machine or a urinary catheter, or who have had a previous colonization with MRSA. Measures to ensure adequate treatment include mechanical drainage (through surgical incision), antibiotic therapy, and wound care. Draining abscessed lesions is the highest priority, including incision when medically appropriate. Cover each draining lesion completely with a sterile gauze dressing. Under the supervision of qualiﬁed health care staﬀ, change dressings daily (or whenever saturated with drainage). If there will be times when there is no healthcare staff available, give extra dressing supplies and complete instructions for the dressing change to patients who have draining skin lesions. Ensure that the detainee/inmate understands how to correctly change the dressing. Reserve antibiotic therapy solely as an adjunct to drainage and wound care for local infections. Where antimicrobial use is appropriate, use antimicrobial agents that are recommended as eﬀective against MRSA. Adjust treatment after antimicrobial susceptibility results are available; discontinue penicillins or cephalosporins if MRSA is conﬁrmed by culture. When skin lesions appear actively infected at the end of treatment, re-evaluate the patient to assess the need for continuation of antibiotics, for repeat incision and drainage, or for decolonization of nasal carriers. While they are on therapy, monitor the patient for side eﬀects and non-adherence to antibiotic therapy. A number of correctional systems have worked successfully with state and local health departments to address the spread of MRSA in correctional facilities. The following is a compilation of case identiﬁcation, treatment and prevention strategies implemented by these institutions. The feasibility of these strategies will vary by facility, the regulations of individual institutions, and the nature of the participation by local health authorities in managing outbreaks. The most important aspects of preventing transmission of MRSA in correctional facilities include personal hygiene, environmental cleaning, use of standard precautions by all facility personnel and staff and detainee/inmate education. Regularly clean or properly dispose of medical equipment used to care for MRSA-infected patients. Dispose of dressings in compliance with state and local regulations. A hospital-grade disinfectant-detergent registered by the EPA should be used according to manufacturer’s instructions for the daily cleaning of environmental surfaces, including sinks, showers, and toilets. A bleach solution is acceptable for this cleaning. Take care to ensure that bleach solutions are appropriately diluted (1:100 dilution of concentrated bleach) and changed when dirty. Using hot water (>160℉ for 25 minutes) or bleach, properly launder clothing and linens. Dry clothes completely before they are removed from the dryer. Ensure that detainees/inmates receive at least two changes of linens per week, daily exchanges of underwear, and a twice-weekly change of outer clothing. Practice adequate hand hygiene before and after contact with blood, body ﬂuids, or other possibly contaminated surfaces. Wash hands between patient contacts. Wear gloves when in contact with blood, body ﬂuids, or other possibly contaminated surfaces. Change gloves between diﬀerent tasks and remove gloves, followed by hand hygiene, promptly after use. Mask and protect the eyes whenever splashing of body ﬂuids is likely. Gown whenever personal clothing could become soiled with body ﬂuids. When possible, notify other facilities and health departments when transferring or releasing patients with MRSA infection. Assign single cell housing to an infected patient, or cohort with other MRSA-infected patients. Consider changes in work assignments for MRSA-infected patients with poor hygiene or when inadequate hygiene is prevalent, and develop a standard procedure for releasing infected patients from assignment or cohort housing. Reserve the practice of decolonizing nasal carriers for relapsing or recurrent infections. Focus work-speciﬁc infection control education to particular groups of personnel and detainees/ inmates, including those that work in laundry service, housekeeping, food service, and health care. Certain barriers unique to correctional facilities may pose challenges for the prevention and control of MRSA, particularly when rapid intervention is required following a cluster of MRSA cases. Access to health care, infection control, monitoring, and community awareness have been recurrent issues in the investigation of past outbreaks. Required co-payment to see a practitioner for skin infections. Limited hours of physician or mid-level practitioners, or other rules inhibiting access to the facility clinic. Unavailability of security and transportation when an outside healthcare resource is required. Inadequate recognition among lay people that boils and skin infections can be transmitted from person to person. Insuﬃcient knowledge that this transmission can be prevented. Inadequate surveillance for new infections because of lack of resources and the complexity of the task in the correctional facility system. Lack of continuity of care after diagnosis of infection because of frequent movement of detainees/inmates inside or outside the facility. Insuﬃcient information from local health departments regarding MRSA outbreaks in the community.